The Phone app in webOS maintains your complete history of every phone call that was ever placed, received or missed since you activated the device. If you are on a webOS 2.1 or higher, this data is also backed up to your Palm Profile so the call log will transfer over any time you activate a new webOS device. While the call log can be a helpful tool if you ever need to refer back to it, there are times where you may want to remove individual entries or wipe the entire log. 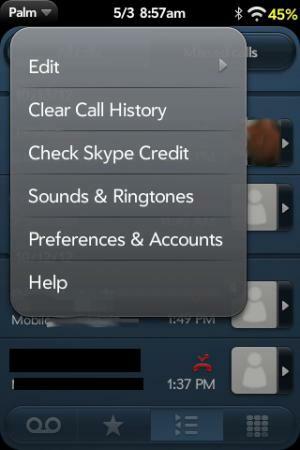 Swipe-down from the top-left to access the Application Dropdown menu and select "Clear Call History"
If you don't want to wipe the entire log but just remove a single entry, that is a simple act of performing a swipe-to-delete on the call log entry and then confirming the deletion.